Last week was chock full of goodness. If I could sum it up I would say the week was about learning, community, exploration and growth. It happened because I'm lucky to live in a city that is host to some amazing things but also because I put myself out there. Way out there! It all started on Sunday night when I rode my bike to the Music Box Theater to see Grace Bonney speak about her book In the Company of Women. She had an amazing panel of Chicago entrepreneurs who spoke about their business experiences. My greatest takeaway was build your community and if you are lucky enough to live in Chicago, this is the place to do it! Monday night I rode my bike (and it was hella windy) to Heritage Bicycles to learn about bikes and coffee. Which may seem like an odd pairing, but it definitely works. It was great to hear Mike the owner talk about the business and how they are branching out. He's definitely multi-passionate and as somebody who has multiple interests it was interesting to learn how he goes for it and makes it work. We got to taste some pour over coffee, which was delicious. We also got to learn about how their bike frames are made locally. I definitely covet one of their bikes. Tuesday night was the 'Wild Card' talk at Chicago Ideas Week. I wish I had the itinerary because it was amazing. There was tap dancing, comedy, singing, philanthropy and place hacking. Thursday I took the day off of work to enjoy all Chicago Ideas Week had to offer. The workshop with Ink Factory was one of the best things I have ever done. Their tag line is "you talk-we draw-it's awesome". They illustrate just about anything and they taught us how to do it too. Words are my thing and while I'm great with using physical objects to translate my vision, I'm not good at drawing, but they gave some great tips for that too! I've started visually brainstorming and making plans for Meandering Design and it's been fun to do. I feel like I accessed part of my brain that hadn't been used for years. I'd highly recommend taking a workshop with them. They really taught about active listening and how to best organize thoughts and information. Things that you can use day-to-day. I got to go to another amazing workshop through Chicago Ideas Week at Ravenswood Studio and Luci Creative. We were tasked with brainstorming and mocking up a museum exhibit. Their staff were on hand to help us through the process and help with the build (ok, it was out of cardboard, but still). It was challenging to do a group brainstorm session with a bunch of strangers and I kind of hung back because I've been trying to not be a control freak. I found some creative things to do while other people built the exhibit. I realized that my introvert super power is being able to stand back and absorb all that is going on around me, synthesize all that information and present it! It was also great to have a tour afterwards to see the studio and learn about all the things they create and build. It was fabulous to have access to a space that normally I wouldn't be able to just stop by and visit. Friday's Chicago Ideas Week session wasn't as exciting but it was super useful and informative. Leo Burnett hosted 'Big Branding for Small Startups' and they gave away so much of their knowledge and expertise. It was wonderful. It was really exciting to be at their offices. Now I just need to take what I learned and put it into practice. Saturday's workshop was making public art with Matthew Hoffman. He started this amazing campaign over a decade ago to bring some light to this crazy chaotic city. He put up stickers that said 'You are Beautiful' and those stickers have become a movement that has spread across the world. We each got a tile and drew our own design on it and then when it was all put together you got this wondrous piece of art that had a little bit of all of us. First make sure you go to Chicago Ideas Week next year!! You'll have access to people and places that will blow your mind! Don't listen to your own limitations. I believed that I couldn't draw, and yet with a couple of tips and tricks Ink Factory had me drawing thoughts. Amazing. It's ok to step back. Doing the group brainstorming at Ravenswood Studio put me mentally in a rough place but I observed, learned and moved on. Sometimes its ok to let other take the lead (even if you don't think they do the best job at it! Recovering control freak here!). Step out of your comfort zone. I'm a huge introvert and I spent the whole week interacting with people. It was good! I deliberately made no plans on Sunday and I gave myself permission to take the day off from everything. I also took a nap. Be open to new experiences and ideas. I really learned a lot from the people I met last week. Let your knowledge shine. Raise your hand. Ask and answer questions. This isn't a popularity contest and if you think you know the answer share it. If you aren't sure then ask the question, because chances are someone else is afraid to ask. Be you! Because you're awesome! If you could please just bring me food and wood every once and a while. I'll just be living in this tiny cabin reading all of the books!! So, I didn't read much in September. In fact the book that I read to read on vacation remained in my suitcase. Although, I did manage to catch up on reading my magazines. Have you read anything new lately? I've been reading the book All the Single Ladies by Rebecca Traister and it is fabulous. I never thought that at 41 I would still be single. At the same time I was never the type of girl who day dreamed about her wedding. I do want a partner in life. I want someone to share my life with, and yet at the same time I want a relationship that affords me the freedom to pursue my passions. I'm strong, independent, smart, have a decent job, pay my own bills and I'm building a business. In my teens through my mid-twenties I was in a relationship. Someone I loved with all my heart who pushed me to be better academically and intellectually (without his support I may have never left my family to go to college) and yet he cheated on me. I went into that relationship not knowing I deserved more. My mom and stepdad got married because his younger sister was about to get married. He felt like he should get married before her. That's it. Their relationship was not good before they married when I was twelve and it only got worse. I was raised by a verbally abusive sexist man. My mother was responsible for all of the household chores and even for making sure he had money in his wallet before he left the house. He called her woman and me little woman. My mother finally divorced when I was in my twenties and she delayed telling me because she was afraid of what I would think. My response was "thank god". So going from my father's house to a seriously flawed relationship was actually a step up. By the time my next serious relationship started (we had been friends for years) I had done some healing but I was still not in a very good place. I ended up with someone who had their own flaws and wasn't able to be a 100% present in the relationship. We lived together, shared a bank account and at one time I thought we would get married. Yet, I was the one responsible for the home. What people don't realize is that it is not the time it takes to vacuum, cook, clean and do the grocery list, it's the mental energy. I felt like there was more to life and a lot of living I wanted to do and so I ended things. After that relationship ended I took french lessons, dancing lessons and started going to different events throughout the city. I started dating, although that was really challenging because I hadn't had to date since I was 16. I was offered a job in Iraq and with no hesitation I took it. When I got back I started a business, got a new job, did this crazy thing called Fear Experiment. My life was full of exciting adventures and an amazing community. On and off I try dating but with every short failed relationship I need to take time to recoup. I try to be open and hopeful with each new person I date, but that is emotionally taxing. Over time I find myself choosing myself. I would rather be single then in a relationship that does not provide me a solid foundation to live my life and I've found that there is a lot of life worth living. While I don't have a man in my life I have some awesome friends who are like family to me. My interior design business is starting to thrive and my life is full. Do I want to be with someone? Yes! But I'm not willing to sacrifice my career or desires for someone else. I'm willing to bend and compromise, but not when it causes me emotional harm. So, for today I will continue to be single. Although I did spend the weekend redesigning my bedroom, which makes me think I might be ready to date again! Every time I hear the phrase 'follow your passion' I kind of want to punch that person in the face (although I am not a violent person) for two reasons: 1) Some people honestly don't know what they are passionate about and 2) I'm passionate about sleep, but I don't think I can get paid to do that. Ironically when I first started a business I did something I loved to do, which was sew. Then I realized that I love sewing for myself and I really didn't like sewing for other people. Could I have made it work, maybe, but at what cost. I started getting angry and resentful and so I switched gears. At first I thought I started selling vintage by a fortuitous chance. A friend and I stopped by an estate sale and I knew the going price for a lot of the stuff I was looking at and so I purchased a couple of things and listed them on Etsy. They all sold so I started buying more stuff. Yes, I love vintage and my home is full of treasures I have picked up over the years or items I inherited, but the reality is I'm super knowledgeable about it. I have been going to antique stores since I was a kid. I can tell you what was fashionable and pricey in the 80s, 90s, aughts and today. When I teach my Interior Design 101 class I give my students a list of resources and it includes a great section on shopping for vintage. I'm sharing my skills and knowledge. There is a fabulous vintage shop in Dekalb, IL called Cracker Jax and I worked there in my late 20s. It taught me so much about the vintage business, especially how to create beautiful displays. In my family DIY wasn't a label it was just simply part of our lifestyle. When I find vintage pieces that are a bit broken down and need some attention I can fix them up, give them a new life and pass them on to a new family. My knowledge set is what makes it possible to run the vintage side of my business. And it is a business. While being able to go shopping for new pieces definitely gives me joy, having to clean everything up, itemize and price, have a photoshoot, list everything and then find a place to store it (thankfully I now have a booth at Beehive so that has helped immensely) is a lot of work. It takes elbow grease, attention to detail and having the ability to take good pictures along with the knowledge of how to price everything. My point is find something you are good at, that you enjoy doing enough that you can do it all the dang time and that is your sweet spot. When a marketing firm from Chicago contacted me and said they wanted to offer me a GM vehicle with a full tank of gas to drive for the week I thought it was spam and I deleted the email. So, when they followed up the next week I was kind of surprised and decided to respond. What followed was the easiest possible transaction and a Chevy Tahoe showed up at my doorstep three days later. It was surprisingly easy to drive even though it was such a large vehicle. The car actually talked to you through vibration in the seats and notifications in the mirrors that helped me navigate Chicago traffic. Considering I was used to driving a zippy little Mazda it was very useful to have some assistance! 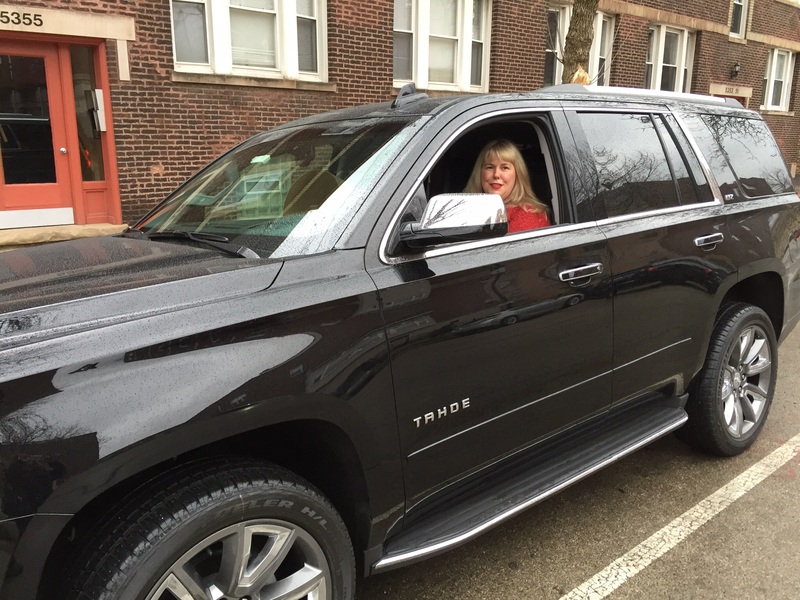 I was really grateful for the Tahoe when I moved into my vintage booth at Beehive Chicago. It would have taken at least 3 trips in my Mazda and I was able to pack everything into the Tahoe. I also have to admit that driving around such a beast of a car, which we affectionately nicknamed Lady Beast was pretty empowering. I got a couple of double takes while driving the Tahoe. It made me feel boss, which is a really great feeling. I set myself the goal to drive the Tahoe for the whole week. I was able to drive it to work every day and around town. Parking at my house was easy, because there is usually quite a bit of parking available. I went out one night and I was nervous about parking so I took an uber instead. 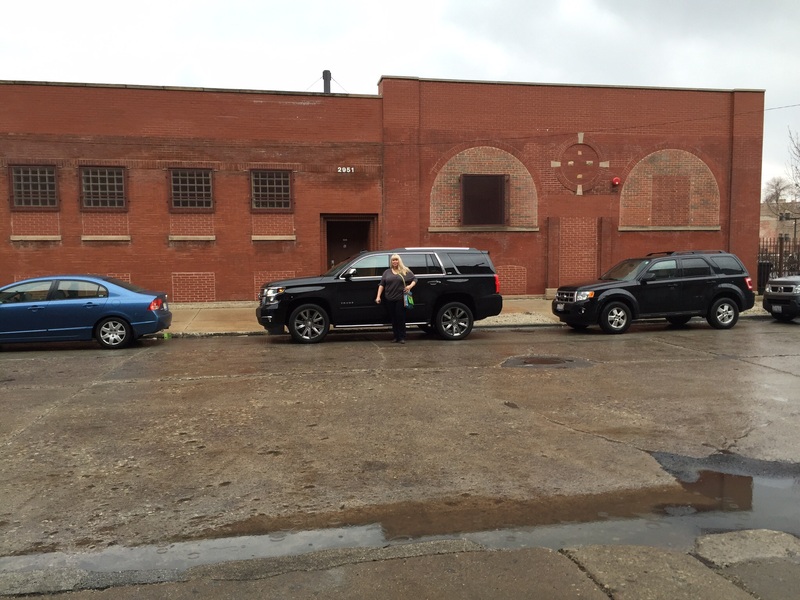 I think that I would love to have a car this big for the business, but for day to day driving in Chicago it is just too big. I returned the Tahoe and went back to my little Mazda. I seriously missed those heated seats but I have to admit that being able to squeeze myself into almost any parking lot is a big plus in favor of my little car. Thank you GM and Chevy for the loan of such a fabulous car. It was an experience.